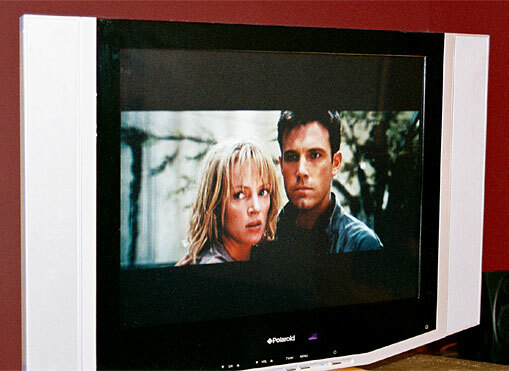 Polaroid in the LCD TV business? You bet: They're slapping their name on everything from economy DVD players to … well, to 20-inch LCD displays. The LCD-2000 is Polaroid's first 20-inch offering in the flat-panel display market. I say "Polaroid," but what I really mean is the Petters Company, which is leasing the Polaroid name, and having a Chinese private label manufacturer produce the product. The LCD-2000 is an inexpensive product offering whose almost exclusive selling point is price. Polaroid's target market for these LCD displays is the price-conscious shopper. Hence, the biggest resellers of the LCD-2000 are big-box retailers like Best Buy and wholesale clubs like Sam's. Polaroid's 20-inch LCD flat panel TV is yet more proof of the old maxim: You get what you pay for. Clearly, Polaroid didn't intend for that to be a quality TV, just a TV. The LCD-2000 is not unlike a fake Rolex in this respect. It's a real watch, sure, but you can't expect it to keep good time. The Polaroid LCD-2000 is a real TV and a perfectly acceptable one at that—so long as you don't expect more, like a great picture quality or multiple inputs. One of the more limited aspects of the Polaroid LCD-2000 is its menu settings. PICTURE settings are limited to BRIGHTNESS, CONTRAST, and COLOR TEMPERATURE. There are no menu setting options to adjust the LCD-2000's color, tint, or sharpness. Thus I could not use SEMPTE test pattern to test the picture. Therefore, it was up to the old eyeball test to measure color accuracy. I found this LCD TV to be lacking in color depth. The LCD-2000 reproduced flesh tones that tended to be paler than one might expect. And that's too bad, because what you get isn't a pretty sight. When I screened Paycheck on the LCD-2000 using a progressive-scan DVD player hooked up to the TV's lone component input, the results were disheartening. For one, the Polaroid left a lot to be desired in the color department. It's not that the colors were "off"—even if they were, I couldn't do much about it—so much as their lack of depth, which made just about everything on the screen seem just a little washed out. Changing the picture mode did little to improve the situation. The "soft" setting was out of the question, and the "standard" to "dynamic" leap resulted in a hideously red-tinted picture. So, I stuck with the "standard" picture, as it was clearly the lesser of two—make that three—evils (faint, fainter, reddish faint). This LCD display does not reproduce blacks very well. Even with the BRIGHTNESS set at 96 (on a 0 to 100 scale), the set displayed only reasonable blacks. The display's black levels were not really the problem, though. What proved most problematic was the LCD-2000's complete lack of dark material detailing. There were scenes in Paycheck where dark areas came out looking like monotone patches of black rather than shadowy walls. This dark matter mapping is the sort of thing one normally sees when brightness levels are set too high on an LCD TV. With the BRIGHTNESS set at 96, the blacks on the screen were calibrated to "absolute" black. Lowering the BRIGHTNESS on the LCD-2000 any further would throw-off the rest of the blacks on the screen (making them lighter than "absolute" black in video). So I was left with grays instead of blacks in my movie, since I prefer to have some modicum of detailing in the darker areas of my pictures. Another of the LCD-2000's shortcomings, picture-wise, had to do with false contouring. This sort of discrete color banding (owing, I suspect, to poor image/color processing on the LCD-2000's part) was particularly annoying in the big interrogation scene in Paycheck. This is the point where Michael Jennings (Ben Affleck) gets hauled in by the FBI for questioning upon completing his three-year "project." Whenever the camera juxtaposed lighter areas on top of darker ones, the gradations in light showed up as separate bands of colors, making the whole thing seem almost cartoonishly artificial. So, if its cinematic naturalism you're going for, the LCD-2000 probably not the TV for you. Which just goes to show how important good image processing is for maintaining the integrity of a video signal. Because the Polaroid LCD didn't process dark material very well, I had to compensate by diluting the black levels in the picture. This is a good example of how mediocre circuitry has a ripple effect, because every element of a picture is interrelated. There is really no one thing that you can skimp on (like signal processing) without affecting something else (like black levels). Having been utterly frustrated in my attempts at coaxing a decently-detailed picture out of this LCD display, which was hampered by a trifecta of picture defects (i.e., too little color, too-gray blacks, and too little dark detailing), I decided to turn the TV off altogether. The Polaroid LCD display has fewer inputs than one normally finds on a display of this sort. It has one input each for s-video, composite video, component video, audio, and VGA. 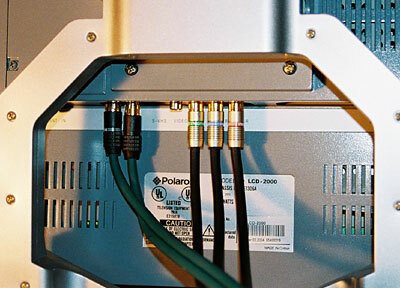 This could prove especially problematic should you want to, say, hook up a satellite cable receiver and a DVD player using component video—the best connection possible—without having to switch back and forth between them, or else settle for a lesser video signal out of composite video or s-video. And, while this LCD TV can double as an LCD computer monitor, the fact is the LCD-2000 proves a rather ho hum display, given its 640 x 480 resolution (though, it does dispatch with scan lines, which is always a plus). The LCD-2000 does have a headphone jack, just in case you want to watch or work in private. Sparse input options leave a little to be desired. As for the Polaroid LCD-2000's sound system … well, it comes with built-in speakers, which is better than nothing. The sound produced by said speakers is anything but ideal. To be honest, it reminded me a lot of the first "stereo" CRT-type TVs. Their big selling point was that they came with two speakers rather than one. Like those relics, the LCD-2000 produced more or less tinny-sounding audio—passable, sure, just not special. This is one LCD display whose audio you'll want to run through a separate component system. Finally, the remote control was eminently useable, though, regrettably, not of the universal "learning" type. Another cost-cutting measure, I presume. But troublesome nonetheless, particularly when you find yourself using multiple remotes to do one thing, like watch a DVD. While the LCD-2000 is not an altogether well-thought-out piece of video equipment, it is a functional TV that doesn't look "cheap" or shoddy. One might even be quite impressed by the unit's shiny aluminum casing and black bezel around the screen. This Polaroid LCD TV has some understated good looks to it, so the LCD-2000 might well pass for a far more expensive unit. As I've said, the biggest selling point of Polaroid's LCD-2000 is its price. For around $1000, you too can own a piece of flat-panel display technology. I suppose owning an LCD TV can be a status symbol, so if you're only out to look good—and aren't a very discerning or picky viewer—this is a relative bargain. If, on the other hand, you want a good-looking TV with a good-looking picture, the LCD-2000 is probably not your best choice of LCD displays. Just think: For a few hundred dollars more you can buy a far better performing unit, picture-wise at least. The bottom line is that, when manufacturers skimp on price, it's usually a safe bet that they've also skimped on quality. And the Polaroid LCD-2000 20" display is a prime example of that. Warren Buffett is famous for saying that price is what you pay and value what you get. Well, with the LCD-2000, you don't get a whole lot for what you spend—far less, in fact, than what you'd get if you spent just a bit more. In short, this 20-inch LCD TV doesn't give you a whole lot of "bang" for your buck.